Dustin and Mackie had responded very infrequently and I hadn't heard from them for some time until I met Dustin miraculously in a campground in 2009, in Revelstoke, B. C. I had been pulled off a train by a bull only a few hundred yards from where Dustin was camping with his father. People have told me - "It was meant to be." However, I did train hop from Winnipeg out to meet them in Vancouver, where I grew up, the year after meeting and interviewing them in Winnipeg in 2004. But after that I didn't see them again for years until I met Dustin in the campground. After meeting him and his dad I went and stayed a few days at Dustin and Mackie's in Vernon, B.C. 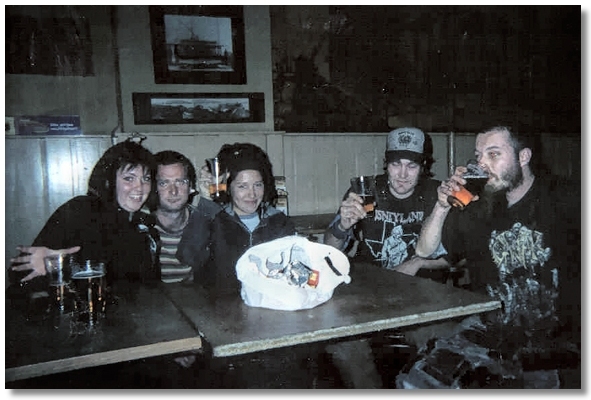 After meeting these crust punks (Modern-day hoboes) in 2004, I wanted to experience it myself. In 2005 I train hopped across Canada after meeting Dustin and Mackie for the second time. I wrote several articles about it. I had Dustin's contact info then, and I met up with them when I reached Vancouver, B.C. It was my first hop and I did it alone. I used the information I had obtained from the kids. Mackie (third from left) and Dustin (fourth from left) in Vancouver, B.C. In 2009 I decided to try and find all of the train hoppers I met in Winnipeg in 2004. Why I didn't go looking for them in 2005 I don't know. Perhaps I was more interested in what they were doing - train hopping, and other train hoppers, than those actual ones - the ones I call "the wanderers." I won't say where I met them originally now, although it's mentioned in other articles I've written. The reason for that is that I've come to the conclusion that too much attention to the activities of train hoppers is not good for them - It's a heat score. After all, it is illegal - and many people who shouldn't be, are attempting it. 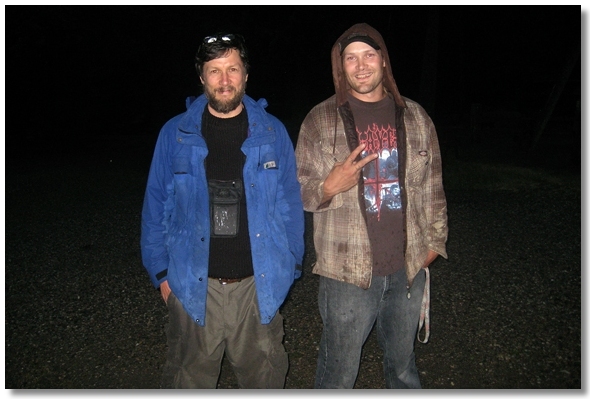 Dustin (right) and I at Canada West RV Park after I was pulled off the train nearby. Having a bit of experience by this time - 2009, I thought catching out of Winnipeg westbound would be quite easy. My aim was to do some traveling and get material for articles along the way - especially any information about the train hoppers I had met in 2004. The trip westbound wasn't so lucky - it was better heading eastbound though. Train hopping is rarely easy. I waited for two days without any luck in Winnipeg back in June of 2009. I decided to hitchhike - Something train hoppers do when they can't catch out. Of course, I refused to do the easy thing, like take the shamehound, (Greyhound) or fly. I'm just going to summarize my trip west up to where I ran into Dustin in B.C. I waited for 48 hours in Winnipeg with no luck. I got a ride with a friend to Brandon and tried to catch out there with no luck either. I walked to the highway after a troublesome night being woken by field mice, which I thought were people walking through the bushes. I caught a ride with a young trucker who had actually stopped to look for his logbooks. He let me come in anyway. Interestingly enough, he began by telling me he had driven, almost nonstop from Tennessee with a truckload of chocolate sauce for Dairy Queen in Alberta. I guess that's why he stopped - to look for his other book. He drank enough Red Bull to kill a horse. Texting his girlfriend as he drove, he talked to me at the same time. "She's from a rich family," he said, "she doesn't know what it means to work." By the time we got to Regina, he was quite angry with his girlfriend in Edmonton. I was happy to exit, but grateful for the ride. I stayed at the Turgeon International Hostel. $25 then, it is $30 now, with membership in 2015. Regina is not far from Saskatoon, so a short bus ride and I managed to catch out of there to Calgary. It's not hard to catch out of Saskatoon but you have to watch people since they will rat you out if they see you. Just like anywhere, I suppose, people seem to derive pleasure in persecuting the poor/vulnerable if they get any chance too. Something I'll never understand. 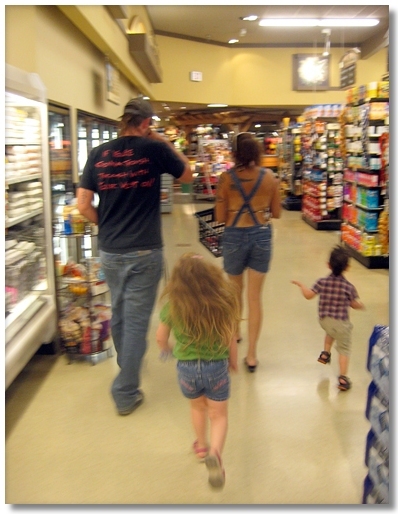 Dustin, Mackie, and their two kids in Vernon, B.C. In Calgary I had a hard time because I was not familiar, at the time, with the yard. To make a long story short - I failed. I took a "shamehound" bus to Banff and then hitched to Field where I spent a fitful night trying to sleep along the mountainside near Field waiting for a train. Had trouble sleeping because I discovered I have a fear of the dark, especially in a black mountainside with strange noises that sound like bears and wolves sneaking about. I did manage to get some amazing pictures, however, in my travels between Calgary and Revelstoke, B.C. In the morning, although I had slept little and realized that having a hammock was a great idea for train hopping - I also realized I had not only nyctohylophobia - fear of dark wooded areas, but also menophobia - fear of bears. But I did manage to catch out. Have you ever been camping in an unbelievably beautiful spot, on an amazingly wonderful summer morning? The kind of day you never forget? It was that kind of day - Sunny, not too hot, not too cold - perfect. The coffee I made on my miniature burner was also incredibly good. My coffee break in Field, B.C. 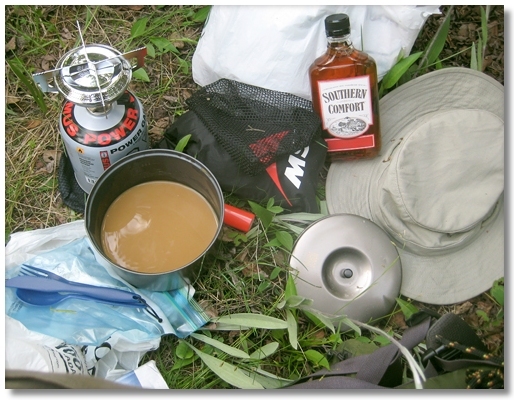 I was basking in the beautiful day, the fresh coffee - looking wistfully down the track towards the direction my ride would be, should be, coming - A huge black bear appeared - He was sauntering, menacingly, straight for me - I picked up my backpack and put it on slowly and talked to him softly. I walked backwards from my little campfire and slowly he followed - all the time wagging his head back and forth like a psychotic bobble-head. I walked backwards up the track with him following. Once he rose up on his haunches and flared his nostrils. That shook the morning cobwebs out of my head! As we walked he never got closer than about 20 yards. As we approached the little town of Field BC I pulled my bear whistle from my pocket and blew it. The only response was that he flared his nostrils again. I ended up by walking right into the inhabited area of Field, B.C. It was Sunday morning and there were people in their back yards looking at me. I think some were heading for church judging by their sharp looking suits and dresses; they were getting into cars, trucks. It was embarrassing. As I got up to a railway crossing a pick up stopped right on the tracks. An older gent motioned me to his truck. "Don't be afraid of Old Charlie, he's harmless," he said with a wink. I stood talking to the old timer as Old Charlie sauntered past, seemingly quite benevolent. He gave me a sideward glance as he passed. I had the strange impression that Old Charlie thought I was a bit odd - or something. The next day - with my cover blown, of course - I caught out westbound and rode as far as Revelstoke, B.C. where I was pulled off the train by a bull. It could be that someone had ratted me out - or a CP Rail cop (Bull) had spotted me. I walked up a country road and then a few hundred yards down the highway where I saw an RV campground. I deliberated whether to hitchhike - I was planning to head to the Okanagan and interview fruit pickers there. But I walked into the camp and started setting up my tent. A truck pulled up and an older guy and young guy got out. I turned back to my work - I heard a voice behind me, "Rod?" It was Dustin, standing there with a big grin on his face. He was staying there, working in town with his dad. I stayed at Dustin and Mackies for a few days - they had two kids! Visit my picture website to see more pictures from this series "www.rodney-graham.magix.net". Next month: The finale to this three part series - In Search of the Wanderers: Ten Years After. I will write about those young train hoppers I met in 2004 - What they are doing now. Yes, I found most of them - electronically of course... and through the others. I will show you that these apparently scary young "street people" as some like call them, are actually good people, they were good people when I met them too.